What are the Seven Wonders of Colombia? The answer to question is up to you, so vote now. Discover and explore the wonders noted below and then make your vote. If you don’t see your favorite Colombia Wonder, then Nominate it through the Contact page. You are invited to vote, but you are only allowed to VOTE ONCE, so pick the BEST ONE and caste your vote. The Salt Cathedral of Zipaquira is a Roman Catholic Church that was built underground. The church is located in a salt mine’s tunnels, which is 200 meters below the ground. Pilgrims and tourists often go to this cathedral because of its unusual location. The Las Lajas Sanctuary is a basilica church of Ipiales. What is interesting about this church is it was built inside Guaitara River’s canyon. This Roman Catholic cathedral and basilica church is dedicated to Our Lady of Las Lajas Ipiales. The San Agustin Archaeological Park is South America’s largest collection of megalithic sculptures and religious monuments. The park can be found in three separate properties which are: San Agustin, Alto de los Idolos and Alto de Las Piedras. Within the city is its Military Architecture boasting of coral stone forts. 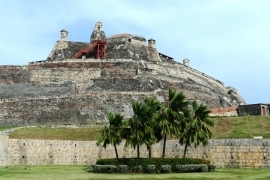 Almost 5 decades later since it was founded, Cartagena’s Military Architecture became a UNESCO World Heritage Site. The Ciuded Perdida is located in Sierra Nevada. It is an archaeological site of Sierra Nevada’s ancient city. History shows it was founded in 800AD, which means it was built 650 years earlier than the Machu Picchu. The Tierradentro is one of Colombia’s national archaeological parks located in Inza, Cauca. The park is famous for its hypogea that can be dated back to the pre-Colombian era. These hypogea were dug up from a couple of excavations made in the park. Tayrona National Natural Park was Colombia’s second most visited park in 2009, which garnered a total of 211,833 visitors. The natural park features a wide biodiversity life, which helps the Sierra Nevada de Santa Marta mountain range. A Roman Catholic cathedral located on the eastern side of Bolivar square. It was built in 1807 and holds the remains of the founder of Bogota. It is the largest cathedral in Colombia and one of the largest in South America.